Mouse lag is a major hindrance that will affect your user experience and it appears that some Windows 10 users are having this issue, so let’s see if there’s a way to fix it. Windows 10 mouse lag in games – According to users, this issue can often appear in games. This can be a big problem since your game performance might be reduced. Windows 10 mouse stutter – This is another problem that users reported. According to them, their mouse frequently stutters which makes it harder to perform everyday tasks. Mouse freeze Windows 10 – Another common problem that can appear with your mouse. Many users reported that their mouse keeps freezing on their PC. This can be a big problem, but you should be able to fix it with one of our solutions. Wireless mouse lag Windows 10 – This issue can affect both wired and wireless mice, but according to users, this issue appears more frequently while using a wireless mouse. Mouse input, pointer lag Windows 10 – Another issue that can appear is mouse input or pointer lag. This is a common problem, but you should be able to solve it easily with one of our solutions. Mouse not moving – Several users reported that their mouse isn’t moving at all. This issue is usually caused by a corrupted driver or your mouse configuration. 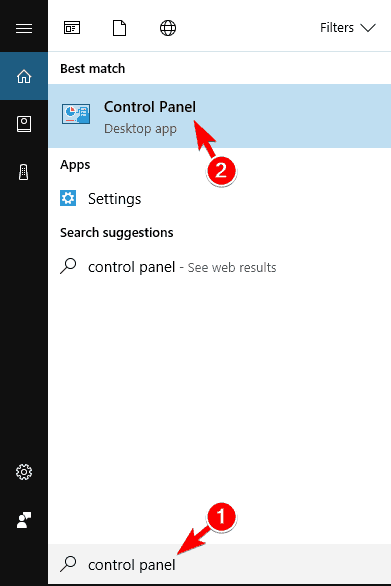 According to users this issue is present after switching to Windows 10, and the issue persists when using Windows 10 and also while using any other software. 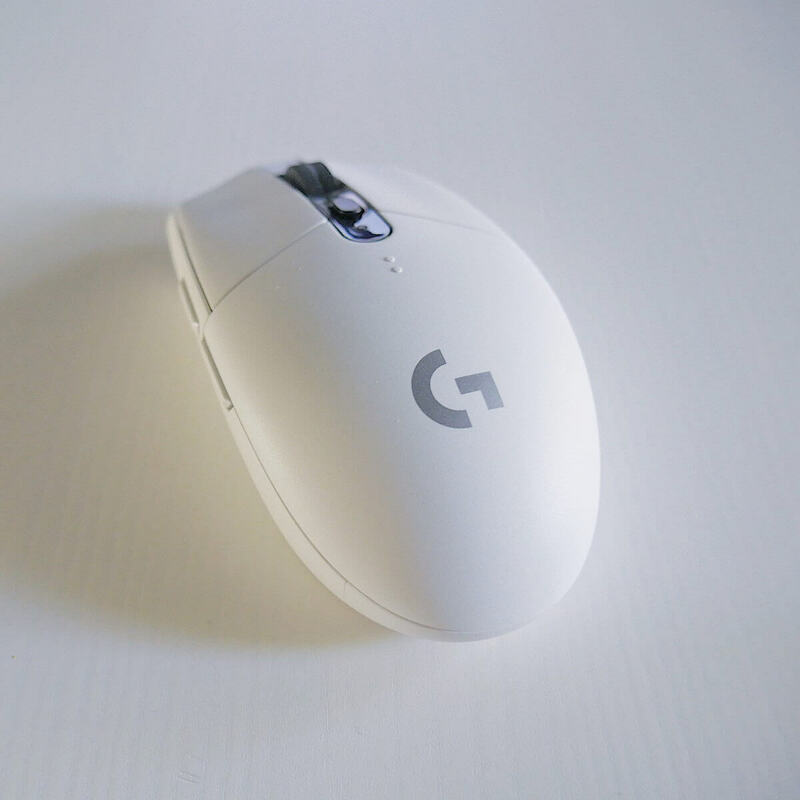 Mouse lag is also a major issue when it comes to gaming and it seriously affects your user experience and performance, but don’t worry, there are few solutions that you can try out. Navigate to Settings > Devices > Mouse & Touchpad. Now locate the Scroll Inactive Windows option and disable / enable it. Try disabling and enabling this option a few times and check if the issue is resolved. 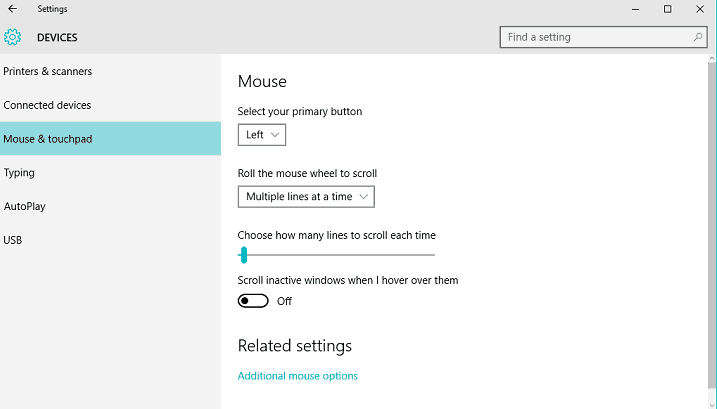 Go to Mouse & Touchpad settings like we showed you in the Solution 1. Click on Settings and go to Advanced Tab. Locate the Palm Check Threshold and move it all the way to the left. 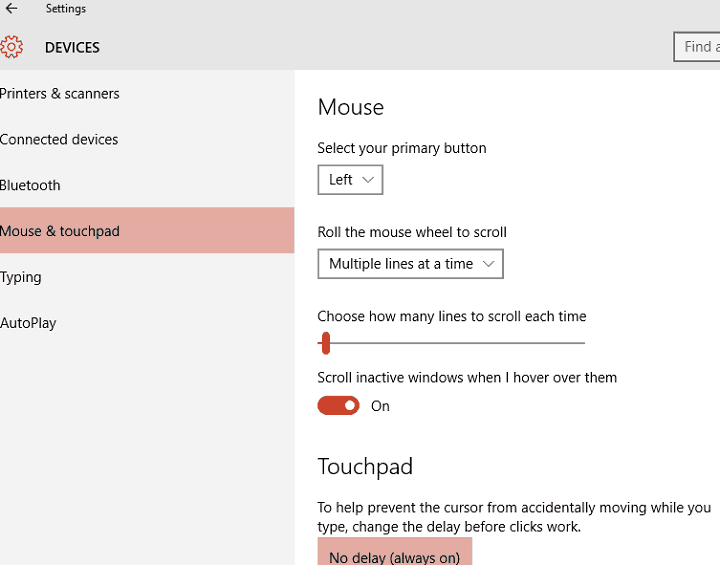 To do this navigate to Mouse & Touchpad settings like we explained in the previous steps. Now find the Touchpad section and set the delay before clicks to No delay (always on). Open Cortana and go to Settings in top left corner. In Settings find the Cortana can give you suggestions, ideas, reminders, alerts and more option and set it to off. 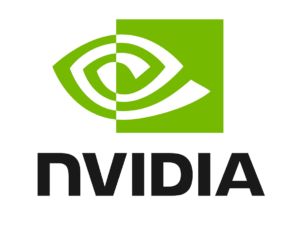 After that go to Device Manager and locate NVIDIA High Definition Audio. Right click it and choose Disable. Same thing might work for other audio drivers, such as Realtek, so try disabling them as well. 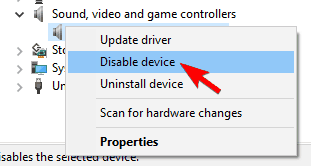 If disabling audio drivers doesn’t help, you might want to uninstall them. If you’re still having issues with your peripherals or you simply want to avoid them for the future, we strongly recommend you to download this tool (100% safe and tested by us) to fix various PC problems, such as peripherals failure, but also file loss and malware. If you’re using Realtek audio, you should know that this issue can be caused by Realtek Audio Manager. According to users, this application starts automatically with Windows and causes this problem to appear. To fix the issue, you need to open Task Manager and disable Realtek Audio Manager in Startup tab. After doing that, the issue should be resolved. You can also fix the problem simply by going to the C:Program FilesRealtekAudioHDA directory and renaming FMAPP.exe. After you rename the file, Realtek Audio Manager won’t start automatically with your PC, and the problem will be resolved. Sometimes mouse lag problems can be related to its frequency. This issue usually affects wireless mice, and if your mouse is lagging, you might be able to solve the problem by adjusting its frequency. To do that, open your mouse configuration software and change its frequency from 500 to 250Hz. After doing that, your mouse will start working normally. Now click on Choose what the power button does. After disabling Fast Startup, the issue should be resolved and your mouse will start working again. Go to Clickpad settings. Navigate to Advanced > Smart Sense and set Filter to 0. After making these changes, the problem with mouse lag should be resolved. Keep in mind that this isn’t a universal solution, and if you can’t find the Clickpad settings section this solution doesn’t apply to you. Several users reported that they fixed mouse lag issues simply by installing the official driver for their mouse. In most cases Windows 10 will automatically install the default mouse driver, and while that driver usually works, sometimes certain issues can occur. If you’re using a branded mouse, check the manufacturer’s website and download the latest drivers for your mouse. Important note: Manually installing and downloading a driver can lead to system damage in case it’s the wrong version. In order to prevent that, we strongly recommend TweakBit’s Driver Updater (approved by Microsoft and Norton) to automatically download all the outdated drivers on your PC. Disclaimer: some functions of this tool are not be free. Open Win + X menu by pressing Windows Key + X. Now select Device Manager from the list. When Device Manager opens, locate your mouse or Realtek audio driver and double click it. 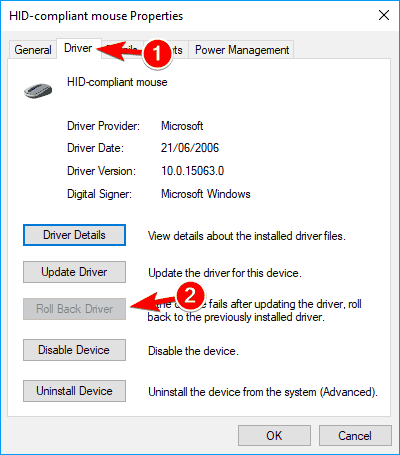 Go to Driver tab and click on Roll Back Driver button if available. If Roll Back Driver button is grayed out, this solution doesn’t apply to you. After rolling back the problematic drivers check if the issue still appears. It’s worth mentioning that Windows might try to automatically update your drivers. If that happens, the issue will reappear. To see how to stop that, be sure to check our article on how to prevent Windows from automatically updating specific drivers. Users reported mouse lag while using a wireless mouse, and to fix the problem you just need to connect the receiver to the USB 2.0 port. After doing that, the issue was resolved and mouse lag disappeared completely. Sometimes other USB devices can interfere with your mouse and cause mouse lag to appear. This issue is predominant if you’re using a USB hub to connect multiple USB devices. 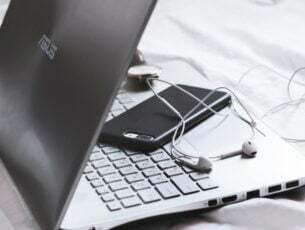 According to users, after disconnecting their portable hard drive from USB port, the issue was resolved. Keep in mind that other USB devices can also cause this problem to appear. If you’re experiencing mouse lag while using a wireless mouse, that might be due to interference. Other devices can cause interference and in order to fix the issue users are suggesting to use a USB extender. Simply connect your receiver to the extender and move it away from your PC and other devices that can cause interference. After doing that, problems with mouse lag should disappear. Many users reported that this solution worked for them, so be sure to try it out. 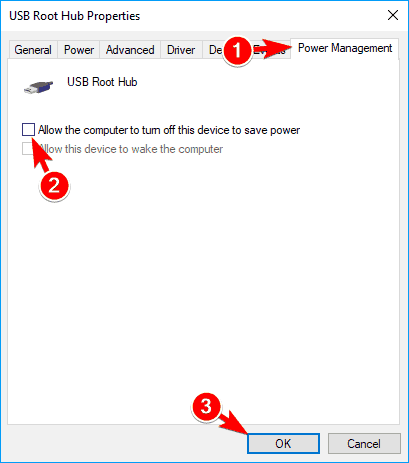 Go to Device Manager and double click USB Hub device to open its properties. 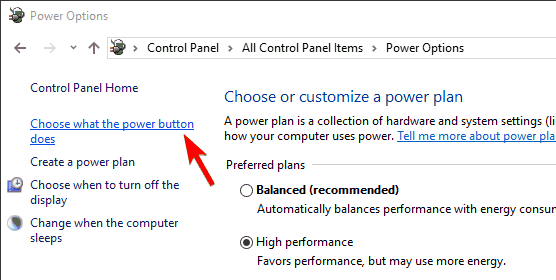 When Properties window opens, go to Power Management tab and uncheck Allow the computer to turn off this device to save power. Click OK to save changes. Keep in mind that you need to repeat these steps for all USB Hub devices on your PC. After making the necessary changes, the issues with your mouse will be resolved. As you can see mouse lag can be a big problem on Windows 10, but we hope that some of these solutions were helpful to you.